Red onion, sliced --- 2 ea. Bay leaves --- 2 ea. Gouda cheese slices --- 8 ea. In a pot over medium heat, place butter. Add red and white onions and thyme; sweat onions until completely translucent; once cooked, add garlic and cook for 2 minutes. Add bay leaves and sherry vinegar. Allow sherry vinegar to reduce by half. Add TABASCO® Original Red Sauce and chicken stock; reduce for 20 minutes. Slice baguette on a bias into four slices long enough to cover the top of your serving bowls. Drizzle slices with equal amounts of TABASCO® Chipotle Sauce; place two slices of Gouda over the top of each baguette slice; place in oven to melt cheese. 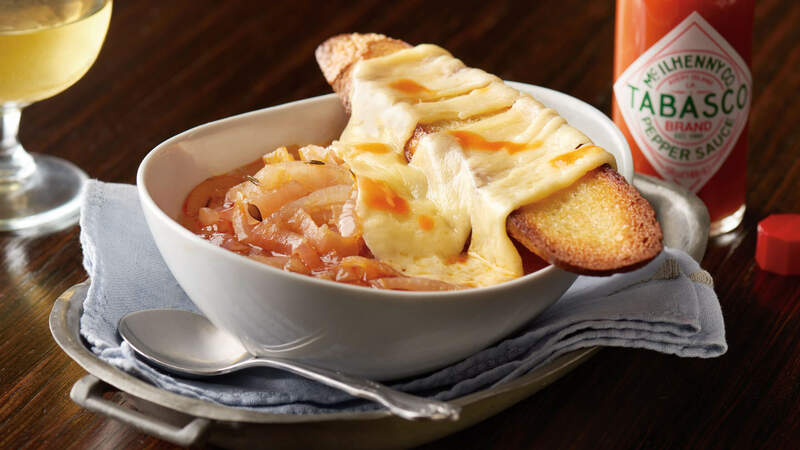 Ladle soup into four bowls; place one cheese-topped baguette onto each bowl.